I’m enthralled and embarrassed by him in ways that are probably only possible when you have loved too much and too soon. Not only am I mystified on discovering that some people my age or a little older are quite indifferent to David Bowie; I also feel much the same ache and anger when I hear him disparaged as I did thirty years ago. While I was taking notes for this essay a friend pointed to a newspaper article: a tedious columnist was claiming that, all brilliance and invention aside, Bowie has never written a song that truly moved anyone, still less consoled them in the wake, let’s say, of a bereavement. Surely this is true, said my friend. Really? You have no idea, I think – none. And yet: the embarrassment. Not so much at the unengaging records that bracket his decade or so of genius and are easily ignored, nor the silliness of this or that image or hubristic acting project. I’m embarrassed instead at a certain brittle grandiloquence, at the inflated thoughts he makes me think. Things like: in or around the summer of 1981, my consciousness changed for good. Or: David Bowie invented me, and he may well have invented you. And the questions he makes me ask, such as this: how much of who you are is still in thrall to images and ideas planted decades ago by someone who was not even sure who or what he wanted to be? Someone whose influence you shared with millions? Exaggerated, sentimental, adolescent questions. Middle-aged ones, too. David Jones was born in Brixton and grew up mostly in Bromley, Kent. (I find it hard to write simple facts about him. I have at this point read so many awful Bowie biographies that even typing that sentence feels like it might do bad things to my prose.) His mother had been a cinema usherette; his father, having squandered an inheritance of £3,000 in abortive efforts to set himself up as a show-business impresario, had settled into a job organizing fundraising entertainments for Barnardo’s children’s homes. When David was about ten years old his father took him to meet Tommy Steele, the alarmingly toothy all-round entertainer whose passing facial resemblance to Bowie still looks in retrospect like an awful warning as to the sort of artist he might have become. Except: there is more, still, of Tommy Steele and a host of other middle-of-the-road actors and singers, more of the straight entertainer’s eagerness to please, in Bowie’s career and persona than he or I or the curators of a vast Bowie exhibition at the Victoria and Albert Museum have cared to admit. ‘If you could look like anybody in the world?’ Still, thirty and more years after the question first occurred to me – still, no contest. I’ve been staring at David Bowie’s face now for quite some time. It’s a cliché regarding the ubiquity of certain faces, but I feel as if I know its planes, moods and textures as well as if not better than the faces of people I love. I mean, people I love more than I love David Bowie. I’ve seen this face looking practicedly aloof: it’s the expression you likely picture when you think of David Bowie – if you think of David Bowie. I’ve watched it crack into a repertoire of no less calculated demeanours: a hollow and paranoid cyborg glare beloved of bad Bowie impersonators, a sidelong darting look of surprise that suggests the subject’s jittery mind has been momentarily engaged by an otherwise dull interlocutor, the sort of faintly embarrassing lost-in-music pout that singers of his generation all adopt on stage at the moment the lead guitarist really cuts loose. There’s an array too of apparently spontaneous grins: a raptorial, triumphant version mid-performance; a naive variant, soon to be controlled, in early publicity photos; the smile that accompanies the slightly panicked charm Bowie deploys in interviews and which conjures, whether he knows it or not, the essence of 1960s showbiz-lad-on-the-make. (Has there ever been an interviewee quite so charming as David Bowie? You’re as likely to spot this smile and the boyish chat that goes with it in interviews from a decade ago as in, say, a late-1970s exchange with Janet Street Porter as he’s about to go on stage – ‘I’ve got a show to do! Coming?’ – or even in the midst of cocaine paranoia in the middle of that decade.) Also, an awkward sneer that seems almost painfully to distort a face whose habitual tendency, so its owner would have us believe, is towards a properly iconic repose. It’s an expression that makes me think of Kenneth Tynan writing about Noël Coward: a man with a face like ‘an appalled monolith’. Here is one expression that I have not seen repeated. The film clip is just seconds long, and comes from some time in the late 1970s; it might even have been shot in Berlin, where he had fled after a famously excessive and exhausting period in Los Angeles. Exhausting and excessive personally, that is. There are no ups and downs artistically for Bowie in the 1970s, just astonishing consistency of achievement amid those frequent reinventions, until at decade’s end it all stops, or near enough. But that is to get ahead of ourselves. It’s night and Bowie is out with a small retinue when he is spotted and the crowd gets too close for comfort. A figure that might be a man or a woman lunges forward and kisses him. Bowie grins and staggers a little and seems to go limp, gazes into the middle distance with a docile look and simply lets it all happen. Addressing himself now to the camera he strikes a perfect because entirely passive pose, and his face is the face of any instance of lazy, angelic cool you care to mention: from Bacall, Capote and Brando to the opiated half-presence of Brian Jones or Marianne Faithfull. 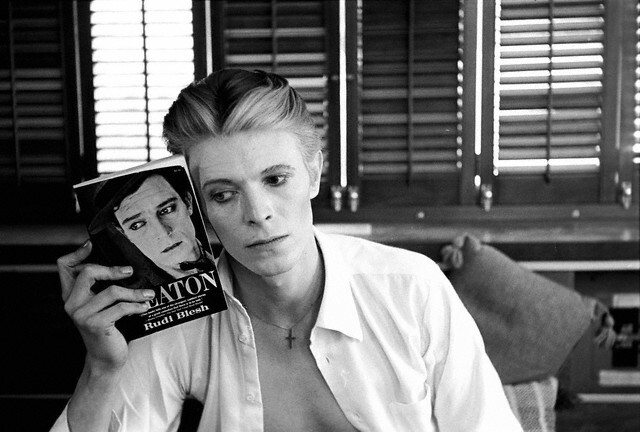 Bowie, of course, haloed here in black and white, knows all of this and more: he sees us seeing the references. He’s managed in a split second to parlay the moment his charisma cracks into something louche, funny, seductive, self-conscious and consequently (almost touchingly) foolish.